Moraiti's family came to Paros from Pelloponiso during the revolution continues 1821 and the wine tradition. In 1970 the Theodore Moraiti chose the smallest of the four children, George Moraiti as sole heir and continue the family tradition of wine. By father's decision studies in Athens Enologist. During his studies with the theoretical training had the opportunity to make the practice of training in one of the biggest wine producing companies in Greece with international recognition in " VOTRYS'' for 4 years. He gained enormous experience alongside noteworthy enologists Greeks and French. After completing his studies, returned to Paros and his father Theodore upon the standardization of winemaking and wine. At 1976 makes its first successful bottling. Since the bottled wine parian become welcome with joy all over the island of Paros. And then become known outside the island. 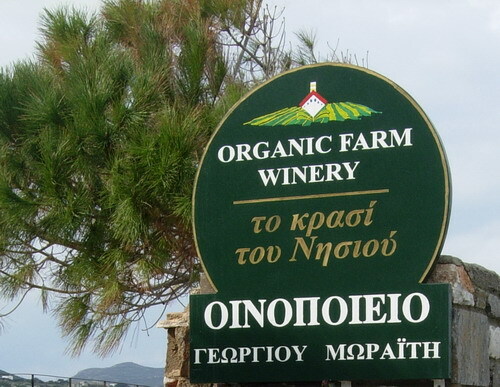 In October 2006 George Moraitis took part in a national competition of organic wines ECOFESTIVAL in Athens and gained the first gold award with white wine ''the island's wine''. Followed by several leading publications from "ELEYTHEROTIPIA" which gave him the champion of organic wines. Because of this is unique not only for recognition of themselves and Paros. Today, continues the tradition, cultivating high-quality organic varieties in a way not extinguished the production trend of today. The winery is in the vineyard and is located in the gulf of Naoussa in place Seaweed. We produce wine ''Island's wine'' in white and red and ''Season'' in white and red. DETAILS: A round wine with body, rich flavor and aroma. Varieties - Monemvasia Monemvasia Excellent flavor! Harmonious, balanced fruit, light in taste. DETAILS: A specially red with aromas in perfect harmony to the taste of black chocolate finish. Varieties - Mantilaria Monemvasia and ruby color, full, rich body, cherry notes. DETAILS: local white wine xyros. Varieties - Monemvasia Extra flavor Monemvasia! Harmonious, balanced fruit, light in taste. DETAILS: local red wine dry, from varieties - Mantilaria and Monemvasia. Ruby color, full, rich body, cherry notes.